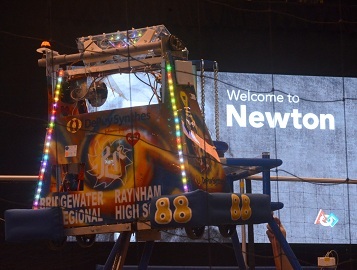 The Bridgewater-Raynham Regional High School robotics team, TJ2, is currently in St. Louis at the F.I.R.S.T. Championship Competition. After today’s qualifying rounds, TJ is ranked 12th out of the 100 teams in their division, which is one of four in the competition, each with 100 teams from around the world. Over the next two days (Friday and Saturday, April 26-27), there will be more qualifying rounds, then quarterfinals, semi-finals, and finally the championship round. The 41 students and 12 mentors left for Missouri after school on Tuesday of this week for the 24 hour bus ride. After arriving and setting up their “pit” area yesterday afternoon, they hit the ground running this morning with practice rounds prior to the qualifiers. They will return to Bridgewater sometime Sunday night, after the long return trip. TJ2 is generously sponsored by DePuy/Johnson & Johnson.